What’s on your May gardening to-do list? May is the month that makes us think of beautiful flowers and may gardening. Mother’s Day is a perfect time to gift mom with a garden related item. Instead of the usual vase of cut flowers, plan ahead and give that special person a naturally-inspired bouquet that changes with seasons, a beautiful raised bed garden. Although pansies may still be looking great early in May, it’s about time to pull them and plant summer flowering plants. Once it gets hot, pansies go down fast. Annuals and perennials give you lots of color bang for your buck. Pinch back the growth of newly planted annual and perennial plants. This results in shorter, compact plants with more flowers. Allow the foliage of daffodils and other spring-flowering bulbs to mature and yellow before removing. Spread a second application of pre-emergent for crabgrass and grass. Fertilize lawns with the final feeding before Summer. Fertilize roses every four to six weeks and control black spot with a systemic fungicide. 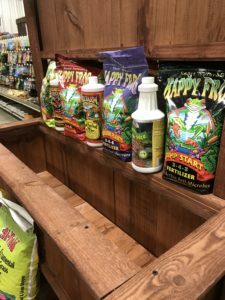 Find beautiful flowering plants and vegetable starters as well as conventional and organic garden treatments for all of your May Gardening projects at Argyle Feed & Hardware! This entry was posted on Wednesday, April 18th, 2018 at 10:29 pm	and is filed under Garden, News & Updates. You can follow any responses to this entry through the RSS 2.0 feed. You can skip to the end and leave a response. Pinging is currently not allowed.